GlamXpert is manufacturer of luxury tent home, and all related luxury facilities and accessories. We are specialized in designing and manufacturing luxury tent home, multi-top resort tent home, aman tent, resort dome tent, glamping lodge tent, safari tent home which are perfect for hospitality, leisure, rental and event industry. 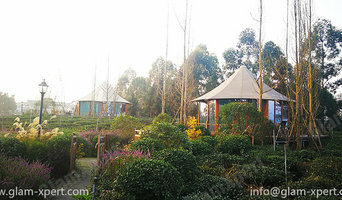 We know the biggest advantage of luxury tent compared to permanent building is its eco-friendly features. With 0 damage to the environment, GlamXpert make your customers’ camping luxurious! For a passionate sports fan, having a personal basketball court or tennis court is the ultimate dream. With your own backyard court, you can host pick-up games and tournaments or just shoot hoops with your family. If you have the space and budget, consider installing a custom court in your Portland, OR home with the help of a Portland backyard court builder. First and foremost, your Oregon backyard court builder should have in-depth knowledge of sport rules, regulations and standards: court dimensions, net heights, lane widths and much more. If you’ll be teaching your friends, kids or others how to play, or if you plan to play on a competitive level, following national guidelines is important. Backyard court builders also keep tabs on the latest in athletics technology to provide you with the most updated options possible for your Portland, OR court. With your input, they’ll design a space that’s customized for your wish list and your home, then handle the construction. When the inevitable wear and tear starts to show, your Oregon backyard court builder can repair, resurface or replace the aging elements. To ensure consistent quality and style, your backyard court contractor might also work closely with a Portland, OR general contractor, remodeling contractor or landscape professional. Here are some related professionals and vendors to complement the work of backyard courts: Outdoor Play Systems, Landscape Contractors, General Contractors. Narrow your search in the Professionals section of the website to Portland, OR backyard courts. You can also look through photos to find examples of Portland, OR courts that you like, then contact the contractor who worked on them.